The Range Rover Sport SVR has a 5.0-liter V-8 engine that generates 550 hp. 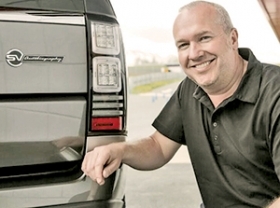 Adlard: Some customers want "something that is a little more sporty or more luxurious." MONTICELLO, N.Y. -- Jaguar Land Rover is joining its high-end competitors in the lucrative performance and luxury derivative business. Launched last summer, JLR's Special Vehicle Operations unit has developed three vehicles. 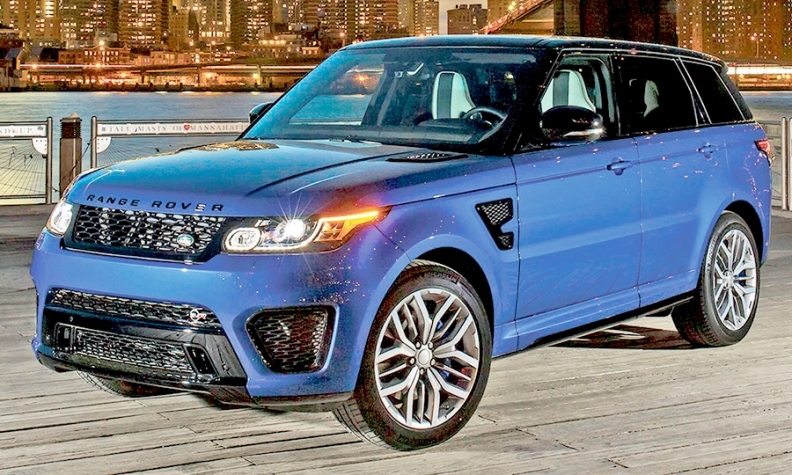 The latest is the $111,400 Range Rover Sport SVR -- priced about $30,000 more than the base supercharged V-8 model. Pricing includes shipping. To date, about 1,600 have been ordered globally. SVO was created because customers asked Jaguar Land Rover to "take some of the vehicles further in a specific direction," said Stuart Adlard, senior vehicle engineering manager for SVO. Like its competition -- BMW's M and Mercedes-Benz's AMG lines, for instance -- SVO will enable Jaguar and Land Rover to charge tens of thousands of dollars more for exclusive, low-volume vehicles with special badges and features. "We have a great range of vehicles, and there is always an opportunity to take each of those to see how we can extend them," said Adlard, 47. "There are customers that want something that is a little more sporty or more luxurious." The SVO engineering arm in Warwickshire, England, has a core team of about 70 employees and another 100 who build vehicles, said Adlard. SVO wants to be as prestigious and successful as its German counterparts. "That is the eventual goal, recognizing we are a new brand -- in that sense, it takes a while to build that image externally," said Adlard. Ford Motor Co., Jaguar and Land Rover's former owner, used to call its in-house speed shop Special Vehicle Operations. Adlard shrugs that off. "If you want to make cars that are this special," he says, "you tell people they come from a division they can recognize." SVO also wants to set itself apart by offering three types of vehicles: those that boost performance, luxury and capability (see box, above). "AMG goes in one direction with their cars. We have three. M is a little fussier," Adlard said. 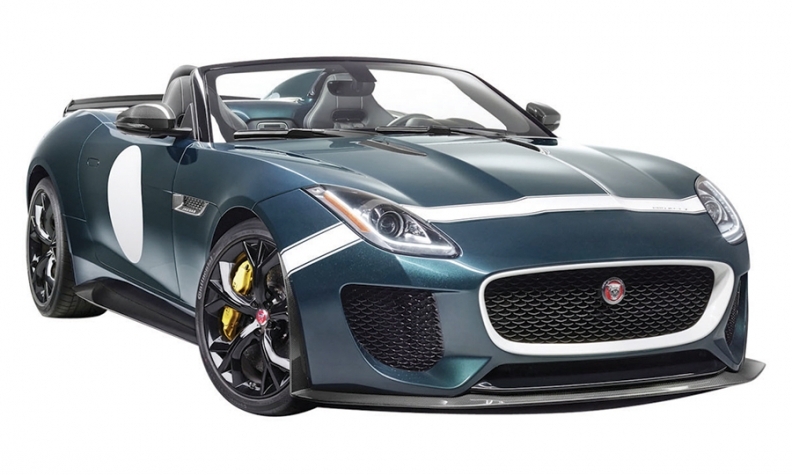 The group also will make low-volume collectible cars such as the Jaguar F-Type Project 7 race car. SVO began promoting itself last summer when it unveiled the Range Rover Sport SVR, a souped-up version of the SUV whose biggest market is the New York City area. Jaguar's F-Pace may be modified by the Special Vehicle Operations unit. The 2015 Range Rover Sport SVR package is only offered on the five-seat model. It has a unique chassis with a retuned suspension and continuously variable dampening to maintain the ride level but deliver sportier handling than the Range Rover Sport. Other features include retuned active roll control to improve the SUV's cornering. The 5.0-liter V-8 engine with 550 hp comes from the F-Type R model. Steering is weightier for a sportier feel. Inside, the SUV has sport seats with an SVR logo and optional carbon fiber veneer trim. New bumpers make the SUV look wider and lower than the Range Rover Sport. It is based on the supercharged V-8 Range Rover Sport with a base price of $80,990 including shipping. A luxury-oriented variant, the Range Rover SVAutobiography debuted at the New York auto show this spring and starts at $200,490, including shipping. A base Range Rover costs $84,490 including shipping. The Autobiography has trim and interior improvements including rear-seat entertainment screen and retractable tables and a champagne cooler with flutes. Deliveries will begin in September. In 2014, SVO showed and sold out of its first car, the F-Type Project 7 based on the F-Type convertible. A concept version debuted a year earlier at Pebble Beach. Only 250 units will be made of the car, which costs more than $165,000. It is a collectible and won't be homologated to be legally driven on the road. U.S. deliveries begin this summer. Similar collectible cars will follow, Adlard said, declining to give details. "We will define a volume and stick to it. We will not go outside of that." Project 7 is a partially built F-Type R model with body panels that are hand assembled at SVO. The car was designed "to commemorate the seven D-Type wins at Le Mans," by the race car made from 1954 to 1957, Adlard said. Project 7 has a tuned 5.0-liter V-8 engine that produces 575 hp. The chassis is also tuned significantly to make it more agile and race inspired. 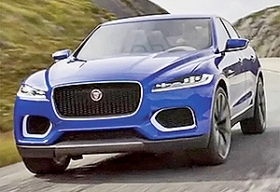 Adlard said other cars are being considered for modification by SVO, including the Jaguar F-Pace cross-over and Jaguar XE compact sedan that go on sale in the United States next year. The XE would match up against BMW's biggest performance seller, the M3, which is based on the 3-series compact sedan. SVO's philosophy differs from that of Mercedes-Benz, which offers an AMG version of nearly all of its vehicles, Adlard says: "You would never find it on all the range." A dedicated custom paint shop opens this fall with capacity of about 100 vehicles a week -- up from 10 to 12 cars the company's operations can handle today. A wide range of extended colors will be offered at dealerships for buyers to place custom orders. Those hues were selected by Jaguar and Land Rover as colors appropriate for the vehicles. But the sky is the limit, Adlard said. "If you want a pink Range Rover, you can have a pink Range Rover."